I’m pleased to be joined by Thomas Paul Burgess today as he shares #TenThings he’d like his readers to know about him. The inspiration behind the story is particularly sobering – see his first point. His latest novel, Through Hollow Lands, is published today by Urbane Books. You can order a copy online here. For many perhaps, the most iconic image that defined our zeitgeist was the unforgettable appearance of the Twin Towers under attack. For me, this event contains a particularly personal resonance. Because I remember exactly where I was on the morning of 9/11. I was in Newark Airport, NYC, preparing to board a plane to Las Vegas for the honeymoon trip of a lifetime. Only later did I realise that a late change of plan perhaps saved our lives that day. Moreover, that the experience would provide the impetus for my current novel, ‘Through Hollow Lands’ (Urbane Press). The proposed road trip with new wife Mary was to take us to San Francisco, Las Vegas and LA. There was no little deliberation regarding the itinerary. Where should we make our first port of call? Eventually, after much discussion and last minute re-booking, we chose Las Vegas over San Francisco. Flying into Newark in the early morning of September 11th, we had to hurry to make the connection to LV. On arriving, jetlagged, we collapsed into sleep. A telephone call from home in Ireland awoke us. Mary’s brother enquiring after our safety and urging us to switch on the TV set. Unforgettably, there was the now instantly recognisable effigy of the smouldering twin towers. In that moment, I realised that –had we chosen the San Francisco option – we would have been on board the doomed Flight 93 that was to tragically crash into a Pennsylvania field later that day. With all flights grounded and rental car stock exhausted, the ensuing days spent trapped in the seeming purgatory of Las Vegas were to prove the most surreal of my life and afford a creative catalyst for my writing. I find writing fiction a challenge. As a novice, part-time novelist – holding down a senior position in a university – I often resented how the mundane concerns of career and ‘real life’, intruded on my communing with the characters and scenarios of my fictional world! This proved most demanding when addressing matters of ‘continuity’ regarding character back-stories, etc. I’ve found that when writing, I’m better when I’m ‘on a roll’, left to my own devices and with no distractions! My first novel is called, ‘White Church, Black Mountain’. (It was shortlisted for the Impress Prize for Literature). As a child, I grew up in a Belfast working class community throughout the worst of the troubles. Later, as a Community Relations worker, my job often involved mediation interventions with communities in conflict. One such occasion inspired the ‘Cathedral Sanctuary’ incident that is a central plot line of the novel. Throughout the conception and writing of the novel, I harboured a personal remit to faithfully represent the lives of the ‘ordinary’ forgotten people who have been touched by the conflict. Two authors I admire are Michael Tournier and Brian Moore. I read Tournier’s ‘The Erl King’ in my early 20s and it made a huge impression on me. Having also enjoyed Gunter Grass’s ‘‘The Tin Drum’, I realised only later, that what I was enjoying was a kind of Teutonic Magic Realism. (Paradoxically, long before I became acquainted with the more recognised Latin American writing of authors like Jorge Luis Borges and Gabriel García Márquez.) Tournier combined myth and philosophy to wonderful effect. His books are insightful, powerful and profoundly moving. I formed a Rock band at school. ‘Ruefrex’ achieved commercial and critical success with the release of seven singles and three albums. Most notable amongst these was the scathing commentary on American funding for Irish Republican violence, ‘The Wild Colonial Boy’ that entered the UK top thirty. The British music press described my writing as, “…a line of poetry written in a splash of blood.” and labelled Ruefrex as “…the most important band in Britain” at that time. We performed on national TV (Channel 4’s ‘The Tube’). I am a Senior Academic at University College Cork in Ireland. As such, I’ve published several academic works on cultural identity and am Director of Youth & Community Studies. Great to find out more about a fellow cat lover! 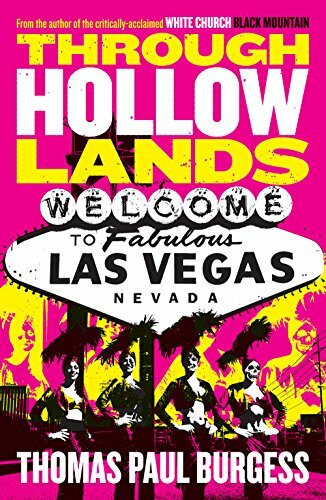 Thank you for kick-starting the LB Group Tour of Through Hollow Lands in a fabulous fashion!